Spain's Edenkaiser have returned with a new recording which continues their raw and old school style of black metal from previous releases and this is a review of their self released 2017 album "Ov Future Wars And Echoes From The Past". War samples along with some heavy riffing starts off the album along with some drum beats a few seconds later before going into a very fast and raw musical direction which also uses a great amount of tremolo picking and blast beats along with the vocals being mostly grim yet high pitched black metal screams. A small amount of melody can also be heard in some of the guitar riffing while evil sounding spoken word parts can also be heard briefly along with the songs also bringing in a great mixture of slow, mid paced and fast parts and when guitar solos and leads are utilized they are done in a very raw yet melodic fashion and the music is very heavily rooted in the 90's second wave era as well as war samples also returning on some of the later tracks and synths can also be heard briefly on a later song. Edenkaiser creates another recording that remains true to their raw and old school style of black metal, the production sounds very dark and raw while the lyrics cover war and nihilism themes. In my opinion this is another great sounding album from Edenkaiser and if you are a fan of raw and old school black metal, you should check out this recording. 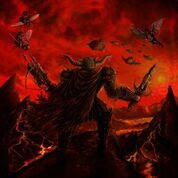 RECOMMENDED TRACKS INCLUDE "Dead Gods Desire" "Killing Dark Speed" "Soul Of The unborn" and "Riding Towards Acheron". 8 out of 10.